The Riddle that is Ukraine | Inside the Eye - Live! For everyone following the evolving tragedy in Ukraine, should we begin by stating the obvious? 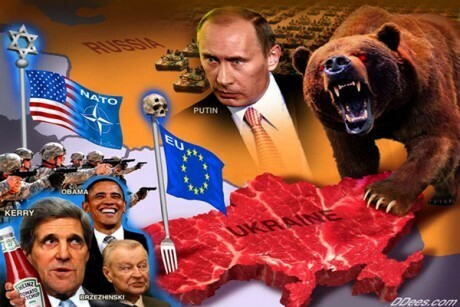 Did anyone believe that what was in plan for Ukraine was nothing but tragedy. After all, considering the track record of “regime change” efforts by America’s “foreign policy guru’s”, aka, Israeli centric Jewish “NeoCons”, what else other than tragedy could Ukraine expect? Let’s consider the NeoCon track records over the past 20 years. Afghanistan, Somalia, Yemen, Iraq, Libya, and Syria – all of these countries are near failed states and mere shells of the countries they were before Jewish (NeoCon) meddling. Iraq, for instance, had been in Jewish cross hairs since the late 1980’s. 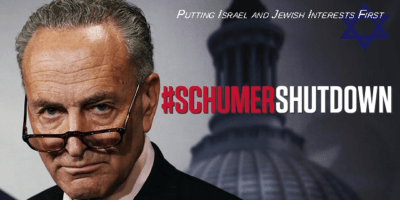 During a Jewish influenced blockade (sanctions) of Iraq during the 1990’s, a blockade that was crafted and implemented under clearly false pretenses, Iraq lost over 500K children as a result of these largely Jewish designed and pushed sanctions. In an interview some time later, then Secretary of State Madeline Albright went on to say that in her eyes, the deaths of half a million children was “worth it”. 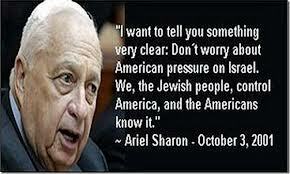 That is, known to all at the time and now to all in retrospect, Jewish policies in America and spread across Jewish controlled countries, contributed to the deaths of half a million children, and all for a reason that was a pure lie – the supposed existence of WMD’s, or weapons of mass destruction. Calling such actions by policy makers “decisions based on delusions” would be too kind: relative to Iraq, this was pre-meditated mass murder. Perhaps one could add into this mix the recent destruction of Gaza, wherein one of the stated goals of the Jewish government in Israel is the removal (regime change) of Hamas. Washington does, after all, often take its orders from Tel Aviv. There are two “success stories” in this Neocon inspired reshuffling of social orders, Tunisia and Egypt. Each of these governments, in many respects, are proving to be even worse for the people over whom these governments govern. In Egypt, a government that has been propped up by nearly US$12 billion in cash and subsidies from the Gulf, still finds itself with rising discontent, while Tunisia is announcing mass arrests of “terror suspects” and “militants”, hardly the type of announcements that support a rising social environment within these “democracy regime change” countries. Hence, when the United States Assistant Secretary of State for European and Eurasian Affairs, Victoria Nuland, was caught in her not so eloquent diplomatic missive “F&%K the EU”, she may as well as have been saying “F&*K the Ukraine”. Considering the track record of Jewish political influence that determins US foreign policy, the only outcome one should have expected for the people of Ukraine was a big Eff You! Aside from all the insanity perpetuated in Jewish controlled (Western media) assets, to include official op-ed pieces and the incessant sleaze that makes it way into “social media” comments sections across the digital sea, what happened in Kiev was clearly a US instigated coup against a duly democratically elected government. That the overthrow of the Yanukovych government was violent goes without saying. 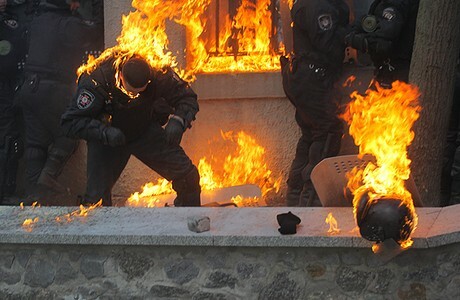 Images of unarmed police officers walking around like Roman candles was but a small element of a damning river of images that attested to the violence that was Maidan. 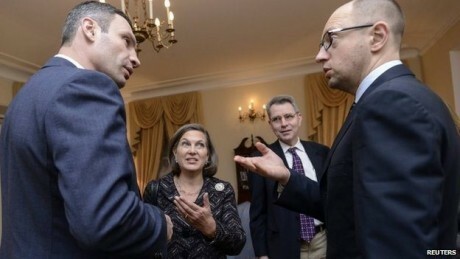 Images of Neocon agents as Sen. John McCain (R., AZ) meeting with Oleh Tyahnybok, the leader of the ultra-nationalist Svoboda party, or Victoria Nuland having photo-ops with soon to be “hand picked appointments” as Arseny Yatsenyuk spread like mold on old cheese across Jewish media assets. The direct involvement in Washington’s overthrow of a democratically elected government was pretty much sealed as “known to everyone” with a leaked telephone conversation between Nuland and US Ambassador to Kiev, Geoffrey Pyatt. 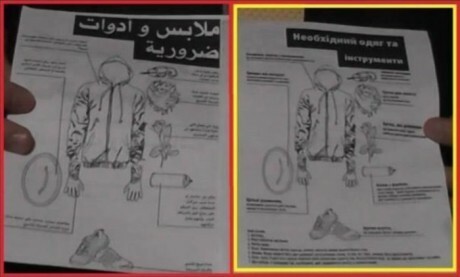 Protest pamphlets found in the hands of Muslim Brotherhood “Morsi supporters and in Ukraine’s Maidan movement. To all those familiar with the violent overthrow of the Yanukovych government, the real question we need to ask and try to understand is “Why?” What is so valuable within Ukraine that would make the United States risk so much for what is really little apparent geopolitical gain. Ostensibly, Ukraine was taken out due to Yanukovych’s refusal to sign an EU association agreement. Obviously, such a refusal can only be viewed as a pretext. Was the overthrow brought about for economic reasons? Economics always plays a part in the equation. Was the overthrow brought about as part of a war to acquire resources? Was the overthrow brought about as part of a larger strategy of containing Russia? Why, precisely, would a bunch of meddling bureaucrats in Washington DC see a need to stick their noses into the internal politics of a sovereign country such that the result is perhaps tens of thousands dead and a country ripped apart with little hope of reconciliation? This is the riddle that is Ukraine. In future posts, we will analyze some of these dynamics.